Spc. 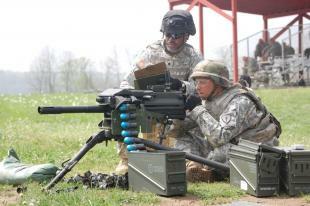 Joseph Merkley receives instruction on engaging targets with a Mk-19 Automatic Grenade Launcher at Camp Atterbury in Edinburgh, Ind., during training for the 1313th Engineer Company. The 1313th trained at MUTC for five weeks leading up to their early summer deployment.